Three men prepare the carcass of a pig in the midst of a busy village scene. A goat, representing the Zodiac sign for Capricorn, floats in the sky and the panel is inscribed DECEMBER. One of three panels with SG82 and SG82, from a series of The Labours of the Months from the same workshop. The scenes chosen to represent the months were varied and popular both in religious and domestic settings, and often give insights into medieval life. Popham pointed out the similarities of the style of these examples to that of Hans Bol (1534-1593), whose miniature landscapes, peopled with small figures, were much in favour with print makers. 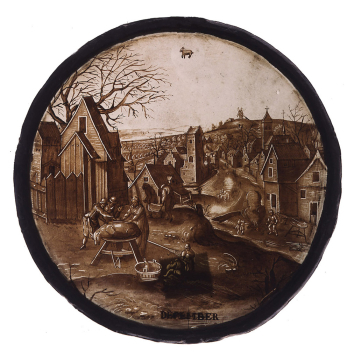 However, the designs for these glass-paintings are not found in the standard compilations of Netherlandish prints.